The mad march hares are out. It's a beautiful time to stir from winter slumber and gaze ahead to a jam packed summer of festivals and touring. So here's a little rundown of the excitement that occurred in those steely cold months. Back in darkest January we broke through the non-provebial glass-ceiling of East London with a gig at the Hackney Attic, way away above the picturehouse. The night, put together by the lovely folk at Autumn Shift, celebrated the premier of the film Inside Llewyn Davis, the Coen brothers' sepia-toned take on New York's 1960s folk scene. Though seemingly remote in time and place from our own generation of folk musicians, the Greenwich Village community of the film represents a vital link in the story of folk music. The American folk revival contributed not only to the rekindling of interest in folk culture on these shores, but also to the development of jazz and rock n' roll. Indeed, it would be unlikely that TEYR would exist were it not for that explosion of creativity and cultural renovation that peaked in the mid-1960s in the USA. It was thus rather fitting, in a cyclical kind of way, that we and a number of other UK folk acts performed a coda to the new Coen film. There was singer/songwriter Vivienne Youel with her finely crafted songs and astounding dynamic and emotional range. Fully-charged rock'n'roller Alex from The Little Unsaid performed an electrifying solo set, teasing a huge sound from his guitar and handful of pedals. And lastly came Buriers with their unique blend - a rap, poetry and folk music mash-up. With their help and the flattering support of a huge number of our London friends we packed out the Attic. So to all those who were there that evening, thank you! The gaslamp glow is strong at Folk of the Wood. Another scene which has enjoyed a number of revivals is the folk dance or barn dance or ceilidh (if you dare spell it) scene. Just in the last decade London has sprouted several young and energetic ceilidh groups, such as Cut A Shine and The Ceilidh Liberation Front, as folk dance has crept once more beyond the traditional confines of it's greatest modern patron, Cecil Sharp House. But tucked amongst the rolling hills of South London in a place called West Norwood a quiet revolution of quite a different nature is taking place. Since last autumn the monthly ceilidh night Folk of the Wood has been offering a mixed night of folk music, story and dance to a wonderfully diverse crowd of young and old, families and friends, folkies and punters. For their February edition we played alongside Ceilidh Tree, the excellent house band and The No Frills Band, a no-nonsense hurdy-gurdy-led folk group. It was a super and refreshingly free-spirited affair with a real family feel between the audience and organisers. For our concluding set the assembled crowd gathered close and attentive - the smiles were plain to see. Then, with a large hurrah, we joined hands for a farewell spin around the floor of the pretty Portico Gallery. 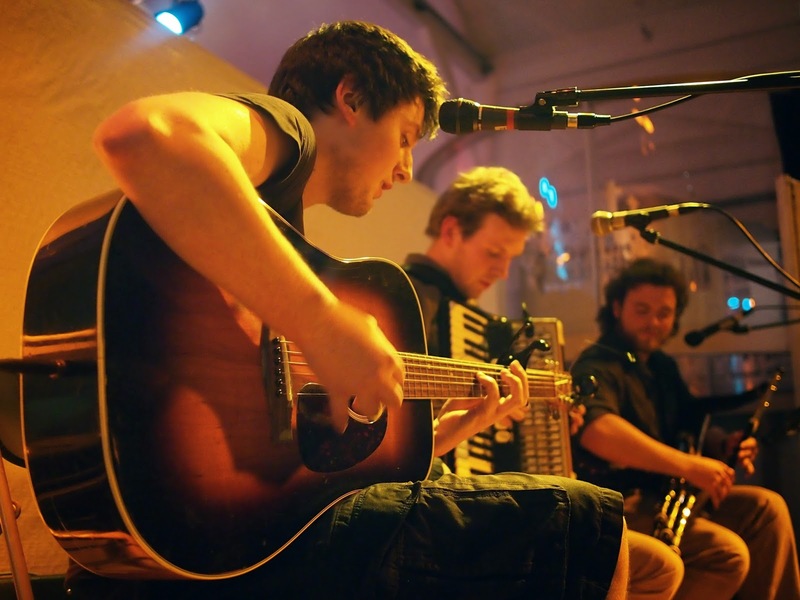 Fans of folk dance take note, south London has added a new star to the ceilidh constellation. With excitement tumbling around in our stomachs we then wended our way out into the countryside to the depths of Suffolk. It's not often you have the opportunity to play alongside your heroes. 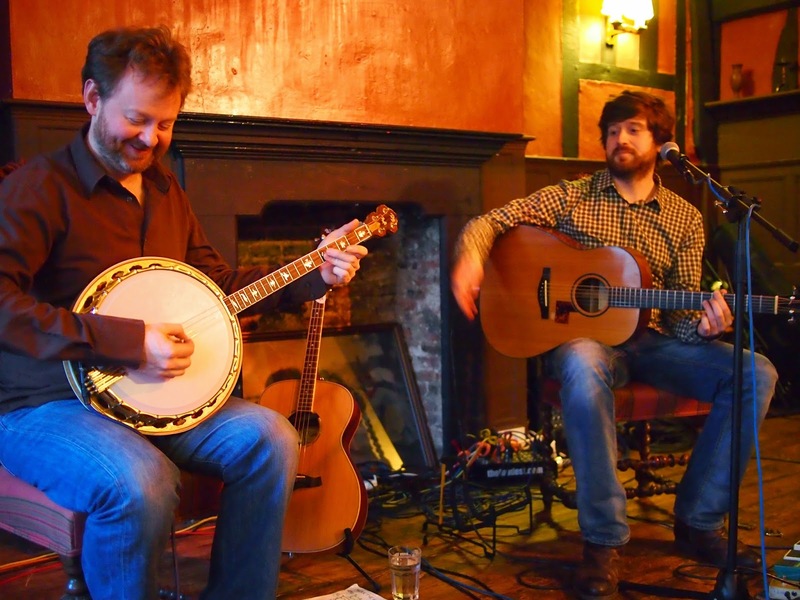 That weekend Kris Drever & Éamonn Coyne were passing by that way to promote their new album Storymap. Our adrenaline was thus skyrocketing as we had the thrilling privilege of supporting the famed duo for their concert at The Fleece in Boxford. From the sleeping winter landscape to the twisting village roads, and from the stoic yet beautiful 15th century pub down to its heavy flagstone floors, everything oozed of ancient. 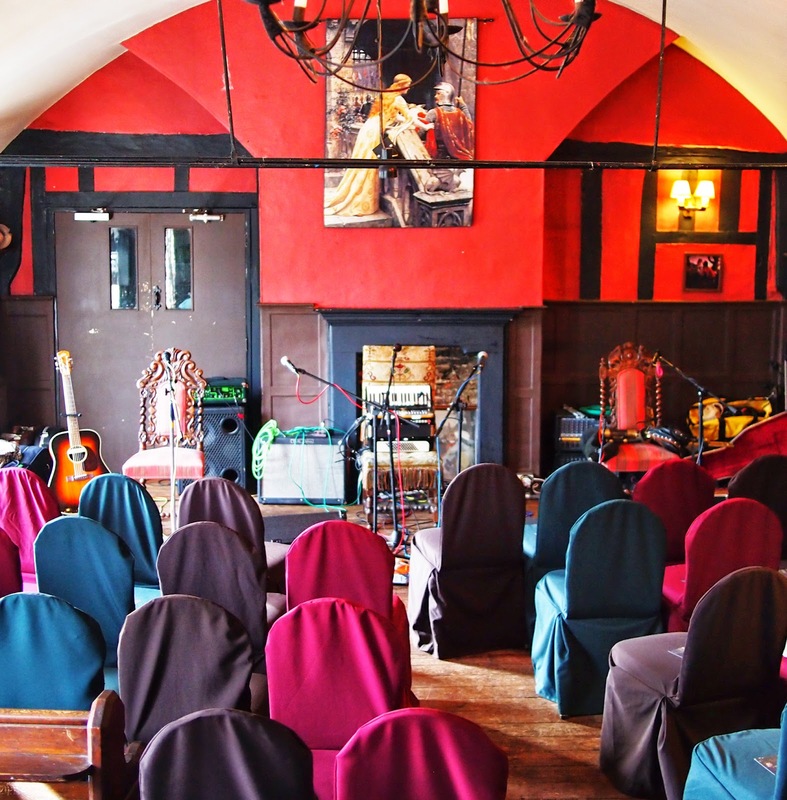 The concert room itself was above the pub up a set of leaning mahogany stairs in the "Guild Room". I can only hazard at what secret dealings may have occurred up there, but there was something satisfying about a gathering of folk fans occupying and repurposing the same space; the fervent loyalty of members to their guilds now mirrored by the rapture of audiences in music. We'd driven up in the van, loaded to the gunnels with audio toys, but now it felt rather inappropriate to be bringing stacks of amplifiers into such a acoustically warm and resonant space. Nonetheless, the sound was mouthwatering; the amps dipped to a bare minimum, the whole space vibrated with gorgeous, detailed tones. No surprise then that playing there was a joy and the packed room certainly seemed to share our feelings - hanging on every note with almost unnerving attention. Kris and Éamonn throwing some shapes. To coincide with the last of the winter shivers we stepped far beyond our usual folksy venues into the urban cool of Notting Hill and Portobello Road. The once threatened yet continually legendary venue Mau Mau Bar more habitually hosts rich musical scenes of jazz, reggae, funk and hip-hop. 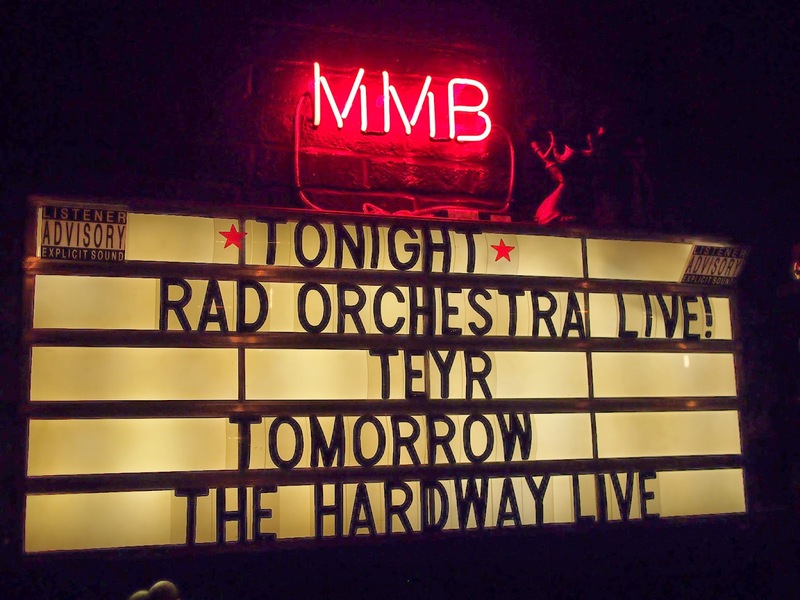 They were in for a wild surprise however in the form of a cranked and amped up TEYR and the mesmerising Rad Orchestra. The latter, in which our esteemed guitarist, James Gavin can be found lurking on fiddle, takes afro-beat to bear against celtic folk sensibilities and balladic blues, all packaged together with an array of musicians on everything from ngoni to tabla to viola. Their extended jams need to be seen and heard to be believed. Take, for instance, the dreamy groove in this video of Shoot Me Like You Should, which when seen live expands into a ten minute plus odyssey. So thank you to Mau Mau and their super new management for saving this historical slice of London from cultural silence. Hopefully we can keep enjoying the cranked-up grooves there whether they be Kuti or celtic for many years to come. 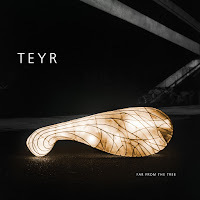 TEYR under a red light.